Y’all know me. Always stretching our food as far as I can, with as little fuss as possible. This made at least 2 meals for us…so that’s another dinner I don’t have to worry about in the next few weeks. I just added the extra meat-bean sauce into a plastic freezer baggie and froze it flat. Perfect meal for the next time I’m having one of “those” afternoons! Also, we’ve got more great giveaways from Hurst Beans and new bean recipes coming up in February too! Soak the beans overnight, or for at least 2 hours in HOT water. Brown the ground beef if necessary. To the slow cooker, add the dried beans, browned ground beef, sloppy joe sauce, water and a little salt and pepper. Set on low and cook for 8 hours. 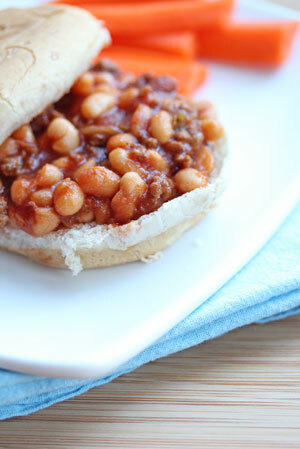 To serve, spoon the meat-bean sauce onto buns, and then enjoy the mess. Freeze leftovers once they are cooled, in a plastic freezer bag or plastic container. To use, thaw in the fridge overnight, or place in a bowl of hot water. Then reheat in the microwave or stovetop. Serve Slopp-Beany Joes with side salad or fresh fruit or veggies. Thanksgiving Butter Beans is my recipe. My favorite Hurst beans are the Large Dried Limas. Always good….and that Bean Pot I really want! I have used the clay bean pots for years. Makes the best baked beans…If I don’t win…where can I buy it? I also use beans in my sloppy joes. I use pork and beans. I drain my beans then I use bbq sauce. I cook my meat and onions then add bbq sauce and let it simmer at the very end I add the porknbeans and cook till hot. they are so delish. I will try yours in crock. belinda great mind’s think alike. That is the same way I make mine. My family loves them that way. When the oldest was about 12 or 13 he stayed at a friends house and they had sloppy joes without beans and he came home telling how strange it was..I laughed.. He then told me mine were “way better” than the other mom’s..He friend had them at our house a few months later and went home and told him mom how good they were. Now she cooks them the same.. When you make your own sauce, do you double the recipe, or just use one batch worth of it? I assume two cans of sauce=2 batches, but just wanted to confirm.